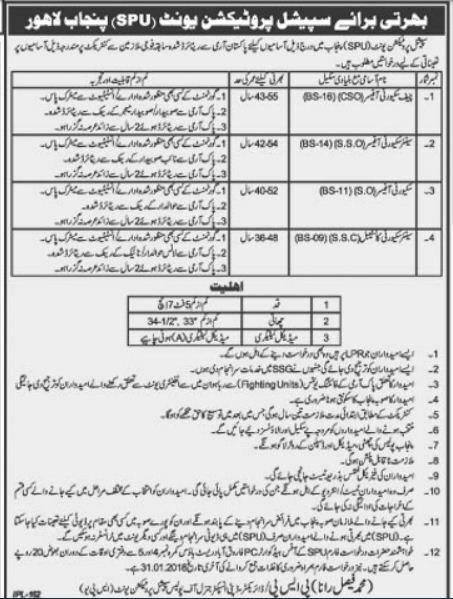 Special Protection Unit (SPU) Lahore New Jobs, 05 Jan-18 Khabrain Newspaper. Special Protection Unit (SPU) has announced latest Jobs in Daily Khabrain Newspaper for Army retired persons. Job titles are as follow, Chief Security Officer (BPS-16), Senior Security Officer (BPS-14), Security Officer (BPS-11) Senior Security Constable (BPS-09). Army Retired persons can apply for these posts. Those Candidates who are on LPR also can apply. Application Form can be collect from SPU Headquarters Farooqabad rest House. Special Protection Unit Lahore Latest Jobs, 05 January 2018.